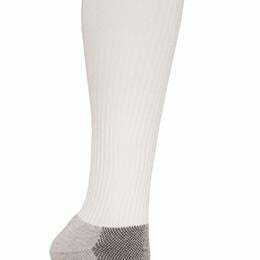 For the active man or woman, athletic compression socks with 15-20 mmHg true gradient compression designed to help athletes recover faster and fight fatigue. 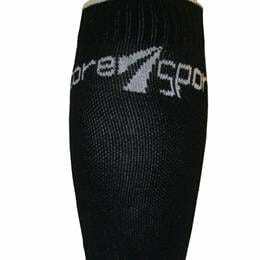 True gradient compression helps to improve blood flow from the ankle to heart, improving oxygenation in the blood and enhancing your workout. Other benefits of true gradient compression include: increased energy for endurance, better performance, reduced muscle fatigue, and shorter recovery time after a workout. 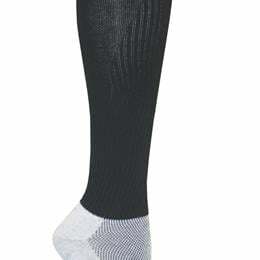 Made using core-spun yarns, a process of twisting fibers around an inner fiber, creating one yarn to enhance strength, durability, and stretch comfort; making this athletic support sock ultra stretchy, easier to put on, and more comfortable to wear. 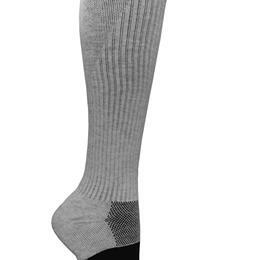 Anti-microbial to help prevent odor in the sock. Made 100% in the USA. Be sure to use the size chart and measuring instructions to determine best size and fit. Care: Hand wash in lukewarm or cold water with mild detergent. Avoid prolonged exposure to heat.